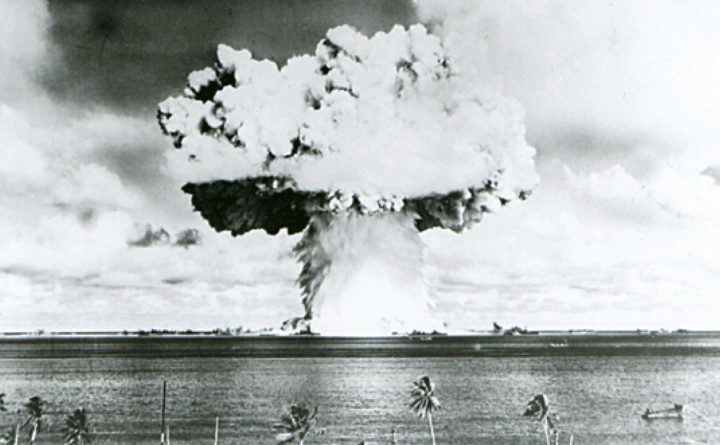 This U.S. Navy file handout image shows Baker, the second of the two atomic bomb tests, in which a 63-kiloton warhead was exploded 90 feet under water as part of Operation Crossroads, conducted at Bikini Atoll in July 1946 to measure nuclear weapon effects on warships. A confluence of events brings a fundamental choice into clear focus. On the one hand, with tensions running high between nuclear-armed North Korea and the U.S., we have an impulsive commander in chief who has sole authority to decide if and when to launch nuclear weapons. This is in conjunction with President Donald Trump’s pledge to completely rebuild our nuclear arsenal, thus provoking other countries to do the same. We are at the beginning of a dangerous new nuclear arms race. On the other hand, the International Campaign to Abolish Nuclear Weapons will be presented with the Nobel Peace Prize on Dec. 10 for “its work to draw attention to the catastrophic humanitarian consequences of any use of nuclear weapons and for its groundbreaking efforts to achieve a treaty-based prohibition of such weapons.” Physicians for Social Responsibility is a partner organization with the group. Mainers are joining in the urgent effort to lead us back from the brink of nuclear catastrophe. A growing group of Maine health professional and religious organizations, including the Maine Council of Churches, the Maine Academy of Family Physicians, the Maine Chapter of the American Academy of Pediatrics, the Maine Nurse Practitioners Association and Physicians for Social Responsibility Maine, are working together to educate their constituencies about the nuclear dangers we face and to call for fundamental changes to U.S. nuclear weapons policy. This past July, 122 nations completed negotiations at the United Nations and adopted the Treaty on the Prohibition of Nuclear Weapons. This treaty calls for the elimination of all nuclear weapons. Although the U.S. government boycotted those negotiations and refuses to sign this treaty, a new international legal and moral standard has been established. The rest of the world is standing up to the nuclear-armed nations that threaten us all with mass murder and global suicide. We must face the reality of the tremendous risk we have created for ourselves, namely thousands of nuclear weapons around the world ready to launch at any moment. Even a small fraction of them used anywhere in the world would kill millions, disrupt the global climate and destroy the economic infrastructure on which we rely to survive, including the public health system, the banking system, electric grids, the internet, and food and fuel distribution systems. As health care professionals, we couldn’t agree more. Every citizen has a role to play. Our fate is in our own hands. We can ignore the frightening escalation of the new nuclear arms race being championed by the Trump administration. Or we can join with leaders of our faith communities, health professionals and civic leaders to urge Sens. Susan Collins and Angus King and Reps. Chellie Pingree and Bruce Poliquin to join in the global effort to prevent nuclear war by supporting the changes in U.S. nuclear policy called for by the Back from the Brink campaign. We hope readers will join in calling for these essential life-saving changes in our nation’s nuclear policy, amplifying the wisdom and prayers of 122 other nations from around the world. There has never been a better time to remember the venerable political proverb: As Maine goes, so goes the nation. With the health of our families, communities and planet in mind, we’re proud that once again Mainers are stepping up to lead us back from the brink. Peter Wilk is a member of the Physicians for Social Responsibility Maine. Constance Jordan is a member of the Maine Nurse Practitioners Association.